Feature1 | Healthy Roaster Co., Ltd.
New way to smokeless grill! Smoke is generated when oils, fats, sauce, lye and gravy drip onto the flame. Healthy Roaster prevents them by having burners placed on the sides. By adjusting the angle of the burners and the screen, smokeless grilling was achieved. 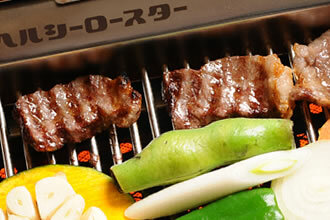 In conventional grilling, the screen gets heated up, burning fats and sauces to generate smoke. In Healthy Roaster, uses the pipe portion corresponding to the screen. It does not reach excessively high temperatures by cooling water through the pipes. 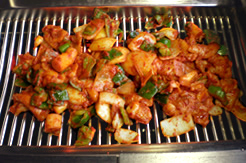 With smokeless grilling, dispersal of oils and fats are suppressed. By removing the source of odor, the room stays clean. Further, the deodorizing, antibacterial and infrared ceramic charcoal is installed and generates negative ion whist producing no carbon monoxide, grilling healthy and juicy meat with abundance of charcoal heat. The C.C. 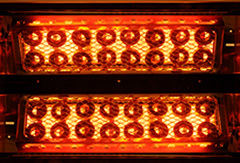 charcoal of Healthy Roaster has no heat irregularity like regular charcoal, providing even infrared heat whilst emitting no carbon monoxide. By achieving thorough grilling to the core, the meat is nicely singed not over the hot screen but between the pipes; this is a completely reversal idea of the conventional grilling. Any kind of food, when grilled with C.C. charcoal, it gets cooked plump and juicy, inducing the quality of the ingredients into the taste. Food is fully cooked to the core, preserving the great taste and helping to prevent the food poisoning at the same time.